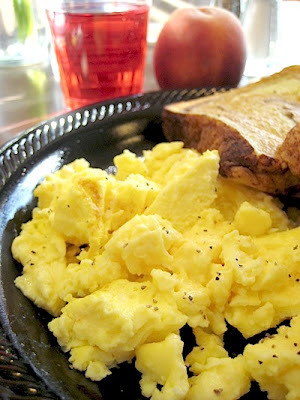 Did you know your Thermomix allows you to make perfect Scrambled Eggs? Personally I love eating scrambled eggs and, since I've discovered this Thermomix method, making them for all my family is such a pleasure. My husband is enjoying them so much for breakfast! He asked me to prepare a Full English breakfast, and I am only waiting to collect all the recipes to make him a perfect one :-). Add butter to the TM bowl and melt. 1 Min. 50°C. Distribute the butter over the bottom and around sides of the TM and also the blades including the top section of the blade unit with a pastry brush (for easy cleaning). Add milk and eggs and mix 10 Sec. Speed 4. Cook for 12 Min. 90°C Speed 2. Chop fresh herbs prior to melting the butter, leaving herbs in TM bowl. - Salt and Pepper and Herbs to taste if required. Break eggs into thermomix, and mix 10 Sec. Speed 4. Then cook Reverse 15 Min. 90°C Speed 2.